There are plenty of smartwatches to choose from on the market at the current time with more being created and launched each week it seems. 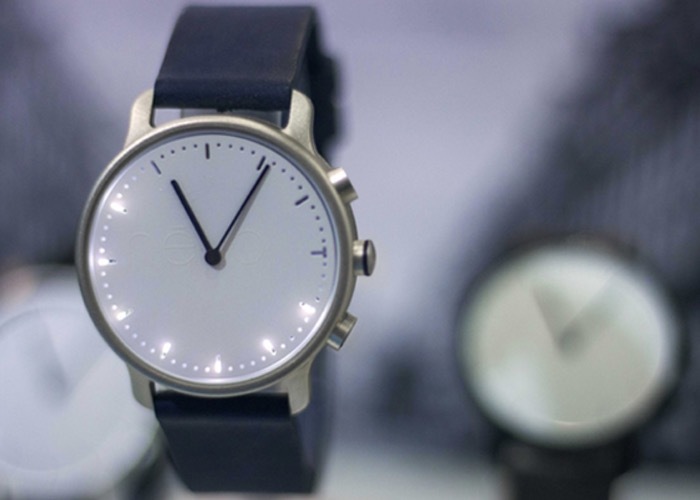 But if you are looking for a minimalist smartwatch design yet still be able to receive notifications the Nevo smartwatch might be worth more investigation. The Nevo smartwatch combines activity tracking, phone notifications and Swiss timekeeping in to one stylist timepiece. Watch the video after the jump to learn more about the Nevo project and see it in action. “Now you can live a healthy, active lifestyle and look good doing it! Making the decision to embed the latest technology into a watch was easy. We already love watches and wear them every day. With that in mind, we created névo, a new class of wearable; a minimalist watch with smart notifications and the latest fitness technology built in. A product of clean lines and simple beauty that makes wearables personal. But névo isn’t just a pretty face. We packed it with the tools to help you look better and feel better. Small changes in daily activity and habits can have a profound positive impact on weight loss and your health. In fact, studies show that people who use step counting devices increase their physical activity by 26.9 percent over baseline. So if you think the Nevo smartwatch is something you could benefit from, visit the Indiegogo website now to make a pledge and help Nevo become a reality making pledger from just $100.